Bob Tryanski Presents :: Keep It! In the summer of 2008, my wife, Hannah, and I had the opportunity to travel to South Africa and Namibia. What began as a simple trip to keep Hannah company as she began working on a new research project turned into an amazing opportunity that I would like to share with you. While Hannah and I were traveling, I read Bill Clinton's book, Giving, and found myself moved and inspired by the collected stories of ordinary people doing extraordinary things to tackle some of the most challenging issues of our time. Organizations such as Heifer International, Habitat for Humanity, The Alliance for a Healthier Generation, and Pennies for Peace are just a few of the organizations that are addressing issues such as poverty, hunger, childhood obesity, human rights, and global health concerns. I was struck by the wide variety of imaginatively conceived, well-organized, and sustainable projects that go far beyond simply "making a difference." These projects transform the lives of others by empowering them to take control of a significant public issue and to play an active role in identifying the need, changing the rules on the ground, and actually solving the problem. The role of the social entrepreneur was a powerful discovery for me, and I asked Hannah to help me to re-imagine how I might focus my work as a speaker, trainer, and storyteller to mobilize student leaders to apply their leadership skills as social entrepreneurs. The result is a new civic engagement program we are calling the "Keep It!" Campaign. This year, we are pleased to launch the first of what we hope will be a series of annual projects designed to mobilize students throughout the US to work collaboratively to solve global challenges - The Campaign for Ivory Park, South Africa. How would you like to help an amazing group of people to literally change the world? There's an old story that goes all the way back to the early days of this nation's history. 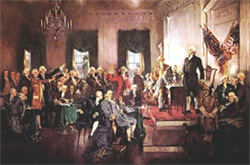 At the conclusion of the Constitutional Convention of 1787, many of the delegates that had gathered in Philadelphia were uncertain and anxious about the new and unique form of government they had worked so hard to create. As they were getting ready to leave Philadelphia, one of the delegates turned to Benjamin Franklin and asked the good doctor what type of government he thought they had created. Franklin paused for a moment, turned to the man, and replied, "A republic, if you can keep it." Franklin's point was that democracy only works when people participate. More than 200 years later, our need to "Keep It!" has never been greater, so why should you have to wait until you're old enough to vote or pay taxes to embrace the idea of civic engagement? In so many ways, Franklin’s life is the perfect example of social entrepreneurship in action. 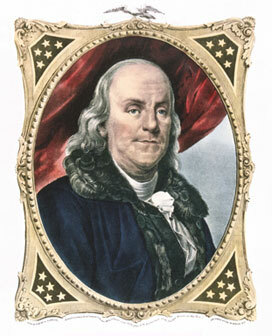 Franklin created lasting institutions that transformed the community. These included the nation’s first library, fire company, postal service and the University of Pennsylvania. The "KEEP IT!" campaign is a civic engagement strategy designed to help young people to develop three qualities of good citizenship: a spirit of public service, a commitment to the common good, and the willingness to take a stand. Commit 26 hours of service to an established cause. Practically, 26 hours represents a substantial, yet achievable commitment of time on your part. The program is designed to be that first step. It is also designed to provide organizations with a steady, reliable, renewable stream of youth volunteers. Twenty-six hours represent one full day (24 hours) of service, plus two hours to tell your story and to recruit the two volunteers who will "Keep It Going!" after you have finished your commitment. Twenty Six hours also represents a regular commitment of 1 hour a week for one half of the year. Focus all 26 hours on one project. We believe a longer-term, more sustained commitment to one organization is important to provide you with more opportunities to build connections, to better understand social issues, and to develop mentoring relationships with members of the community. Everyone loves a great story and we all benefit from the sharing of best practices. Organizations that are just getting started will be able to look to your story for inspiration, for ideas, and for interesting ways to move forward. Writing up your work will allow you to reflect on the personal impact of your commitment. Facebook makes it possible to bring your story to life with words, pictures, and video. Recruit two or more volunteers to duplicate your efforts. Organizations that take the time to develop volunteer programs for young people want to know that their time has been well spent. Recruiting two more volunteers after you have completed your commitment will guarantee that you will leave a legacy that ensures the program will continue.